Smartwatches haven’t been around for that long, most of the one you see on the market have touchscreen displays like on the Asus ZenWatch 3 or Apple Watch but some do not, such as Pebble’s lineup of smartwatches. 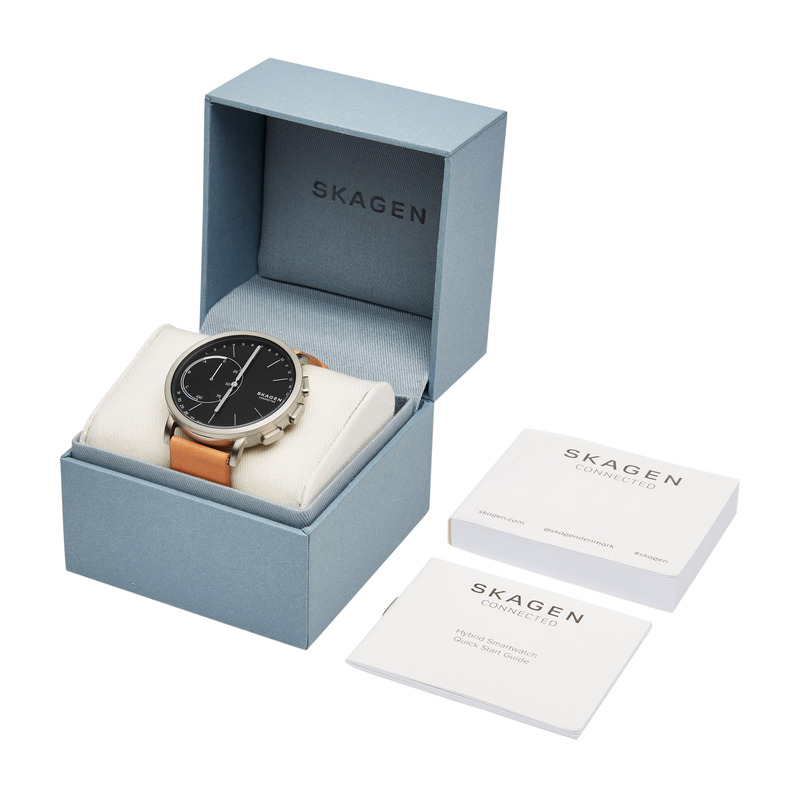 But Skagen (along with other brands in the Fossil group), a brand that focuses on Danish design is looking to change that with the introduction of something called a hybrid smartwatch. It combines the connectivity and notification alerts of a traditional touchscreen smartwatch with the stylings of a traditional watch. I’ve been using the Skagen Hagen Connected Hybrid Smartwatch for a few weeks now and I wouldn’t say the Skagen offers the best smartwatch experience but it’s definitely different and the most different from other traditional smartwatches. 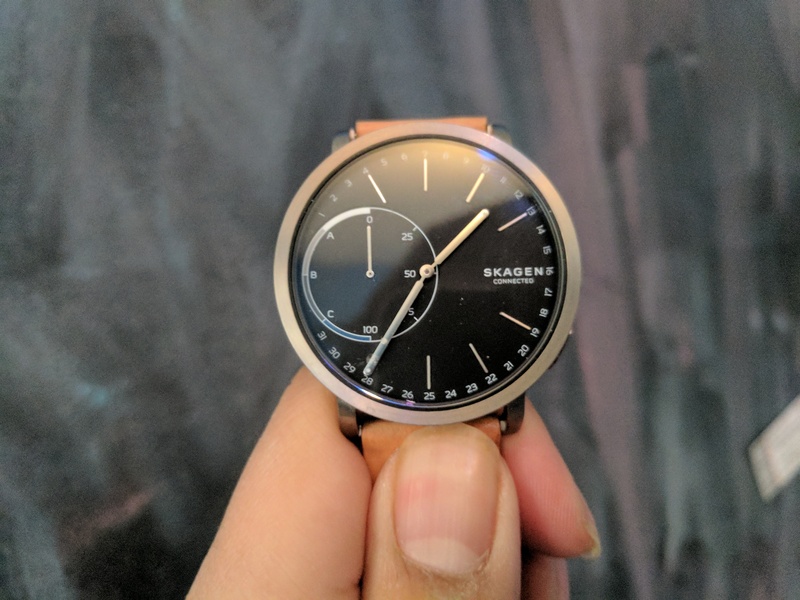 *Editor’s note: Even though the Skagen Hagen Connected isn’t a traditional smartwatch, meaning it’s not running an OS on the watch itself, for the software portion of this review, I’ll be focusing on the Android app. 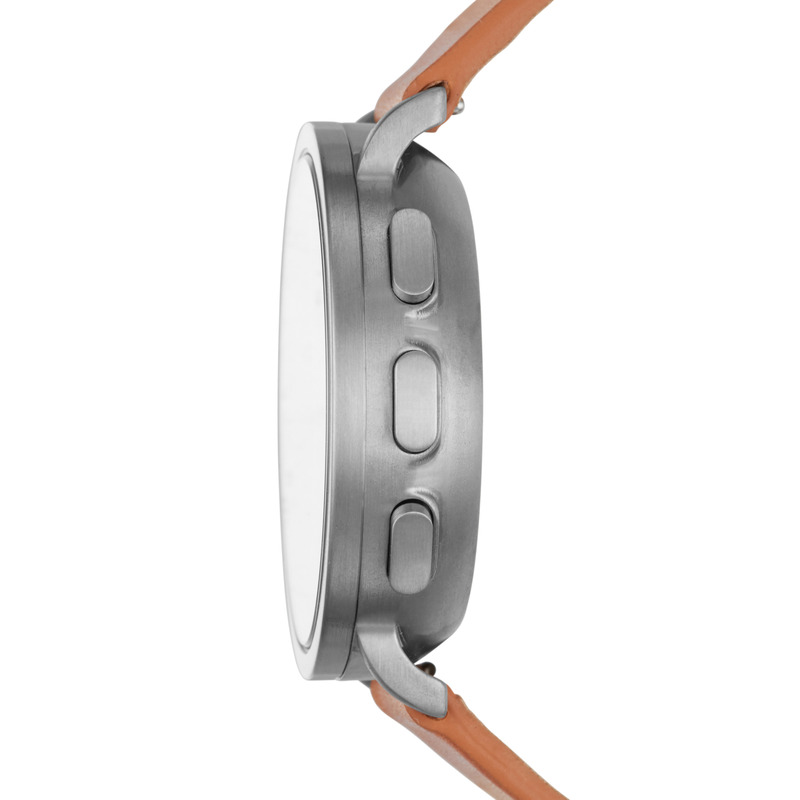 The main watch case is about 1.5-inches and is a typical size for round smartwatches. On the right side, you’ll find three buttons. The top button will make the watch’s hands show you the current date. The middle button will show you a second time zone that you can set yourself via the app. The bottom button can be used to control your phone’s music playback or as a camera button when your phone’s camera app is open. 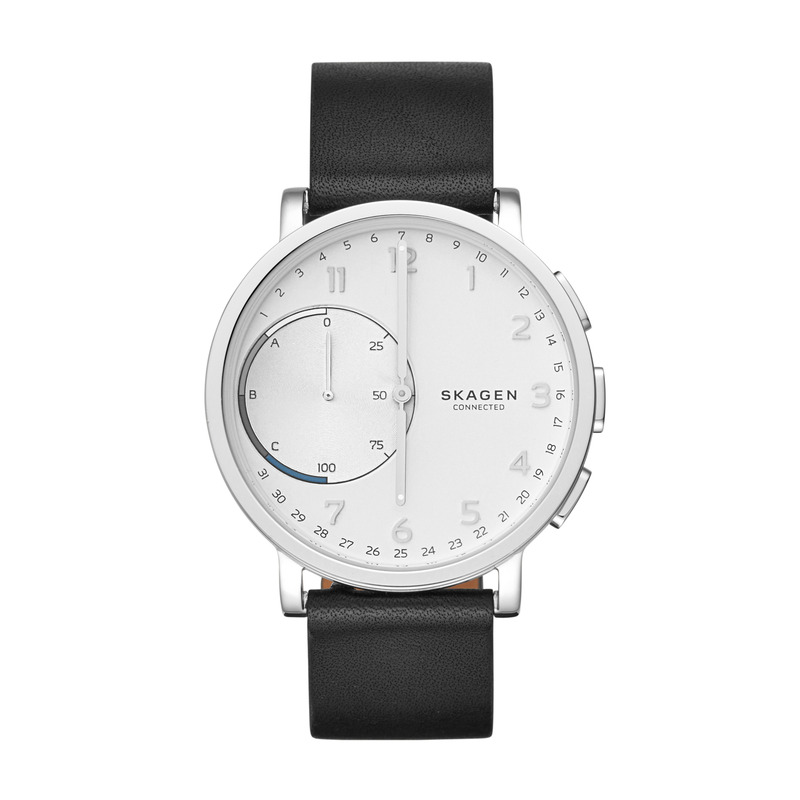 The Skagen Hagen Connected has a very minimalistic design. Which may be jarring at first and can take some getting used to and in my time using the watch, I couldn’t fully get used to the minimal design, it was somewhat hard to tell what time it was since instead of numbers, there is only line where numbers would be found. On some of the other design options for the Skagen Hagen Connected, there is numbers but sadly that wasn’t the one that I tested out. 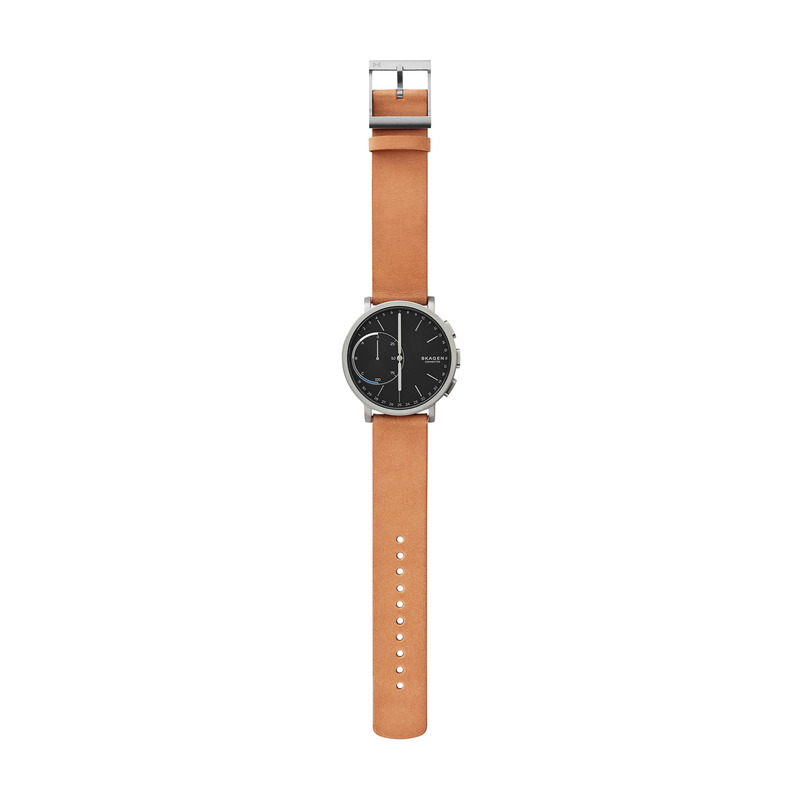 One of the other style options for the Skagen Connected Smartwatch that has numbers on the watch face. The Skagen has a main dial and a small dial with in it. The smaller dial has four colour areas (blue, grey, white and dark grey) along with the letters A, B & C, that is so you can set it to different notifications. For example, you could have the watch hands set to blue when your friend texts you or you receive an email. Also in that small dial on the right side is a sort-of progress bar that goes from 0 to 100 to show you how much you’ve completed your daily goals such as steps. Note, that you can only set up to 6 contacts under your My People, so you watch will notify you if you get a text, call or email from those people. Sure, this might be okay if you only have 6 people contacting you all the time but you’re out of luck if more than 6 people are calling, texting or emailing you. For people who contact you outside of the 6 that you decide, they’ll just go in the All Texts or All Calls sections which makes it harder to know who is contacting you because there is no screen on the Skagen Hagen. Also you’ll only be able to set up to 6 apps to get notifications from and two are already taken up by All Texts and All Calls. The watch runs on a regular coin cell battery and can last up to 6 months as compared to 1-2 days on a touchscreen smartwatch. The watch does have quick release pins, so in theory you could swap the watch bands later on and it uses a 20mm band. 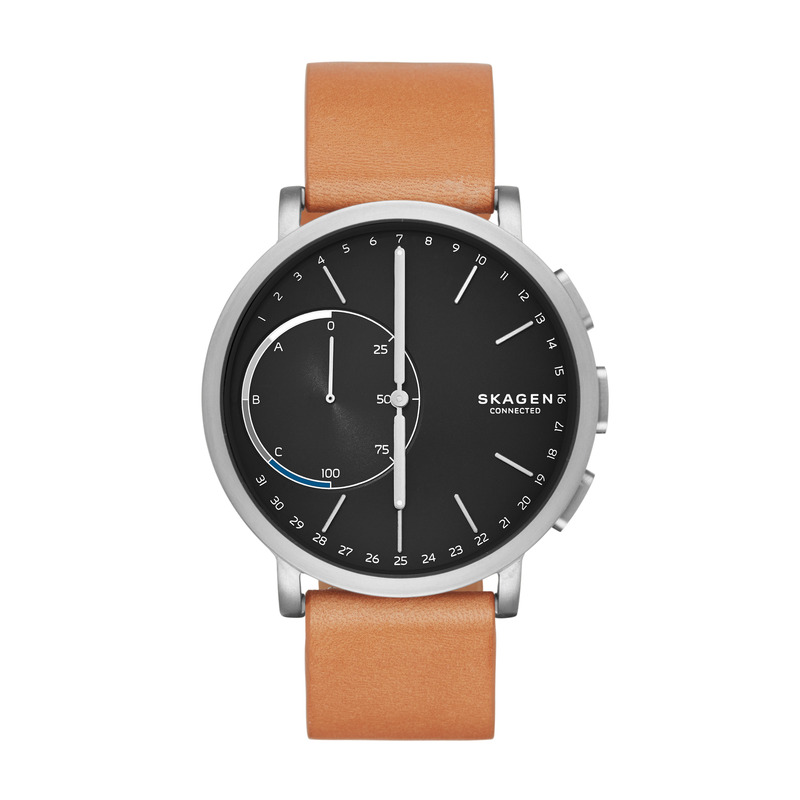 The Skagen Hagen only comes in one size and it works with both Android devices running 4.4 or later and iOS 8 and later (on the iPhone 5 and newer). The Skagen Hagen Connected watch is available in with a leather band or a stainless steel metal band and a either a black watchface or a blue or white one and retails between $250 CAD and $275 CAD and is available at TheBay.com and BestBuy.ca.The unit that I tested out was the one with a tan leather band and retails for $275 CAD. 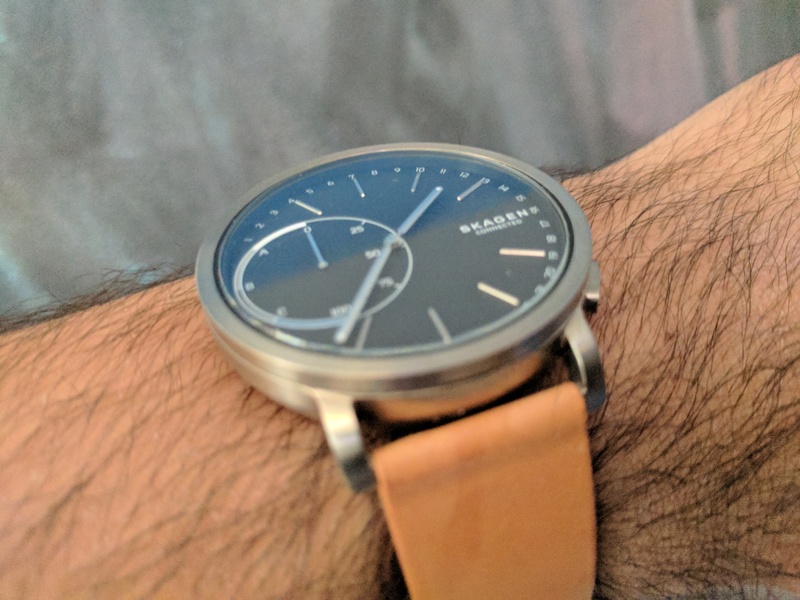 Since the Skagen Hagen Connected isn’t running any software on the watch itself, for the software portion of this review, I’ll be talking about the Skagen Connected Android app. 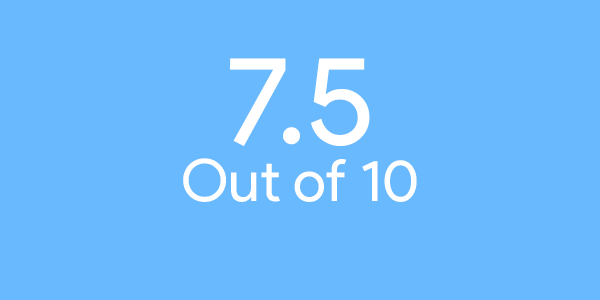 The app itself is very minimal just like the watch itself, which is both good and bad. It probably seemed like a great idea at first to make the app minimalistic so it would seem like it would go along with Skagen’s minimalistic design philosophy but in practice it wasn’t. 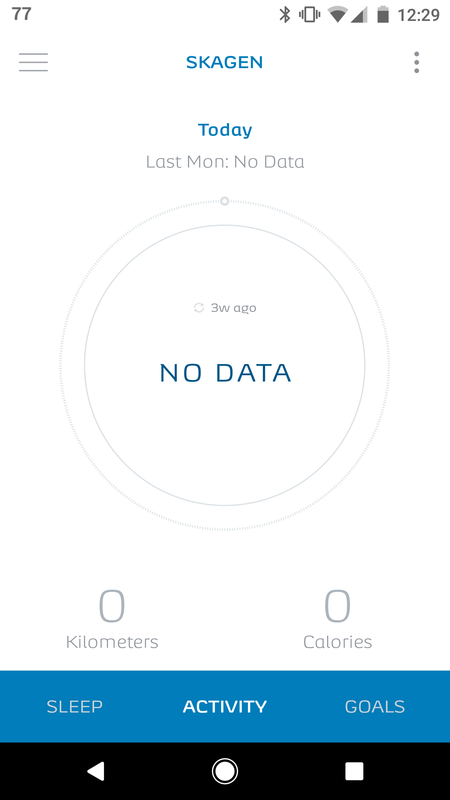 Another thing to note is that the Skagen Connected app requires location services to put on all the time even though the watch connects via bluetooth to your phone. Having location on all the time can easily kill your phone’s battery and I’m guessing the main reason for this was because one of the features of the watch is to automatically change time zones when you do but this feature still could have be implemented using your phone’s timezone settings. Also in the app, is where you’ll find some health and fitness aspects such as sleep tracking and steps. 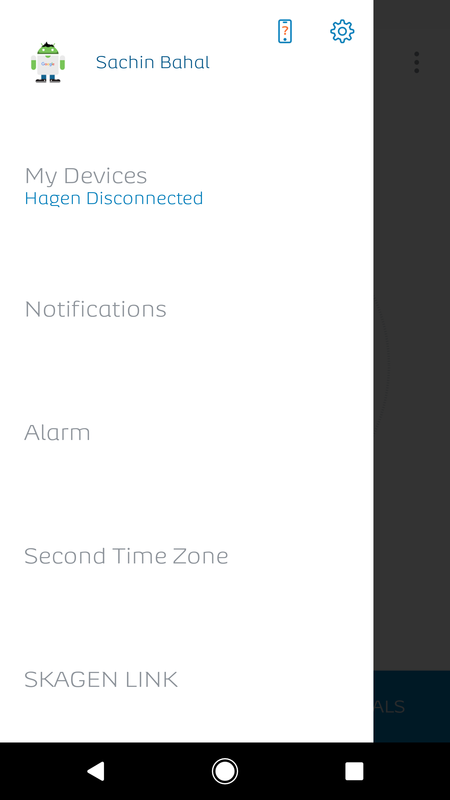 The top left three line button you get access to the menu to control things like connecting to the watch, notifications, alarm, second time zone and Skagen Link (which is where you can decide what the bottom button does when you press it). 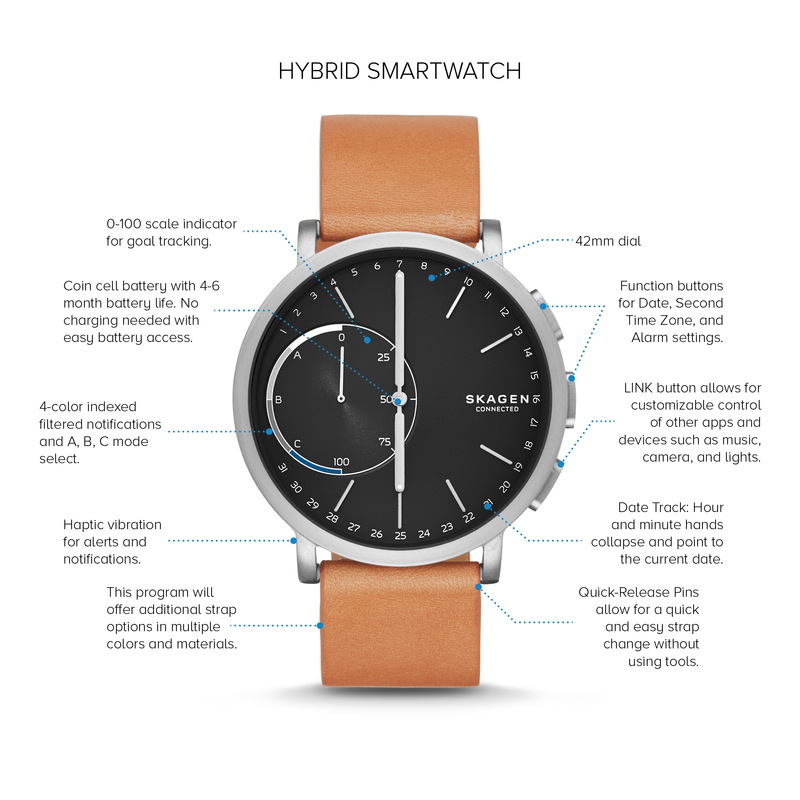 Overall, I applaud what Skagen is trying to do to help differentiate in the smartwatch space and the Hagen Connected smartwatch is a good first-gen product but just not a great one. Personally, I wouldn’t rush out to buy the Skagen right now, I would wait until the next version comes out or take a look at what Fossil (which owns the Skagen brand) is doing, they have released hybrid smartwatches but are probably better suited for the everyday consumer looking to getting a smartwatch that doesn’t really look like a smartwatch. Smartwatches haven’t really found their place in the world, they have only really hit mainstream consumers within the two years and people haven’t found the need for a smartwatch just yet. So don’t feel like you need a smartwatch right this second, cause chances are that you don’t really, you just really want one.